GetDivorcePapers.com provides professionally completed, 100% court-approval, money-back guaranteed Indiana divorce forms. Just create an account, complete the interview, and file for divorce. Our case managers do all the work for you, and send the completed Indiana divorce forms when they are ready to be filed. 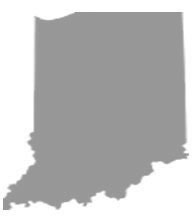 In order to file a divorce case in Indiana, one of the two spouses is required to be the resident of this state for six months prior to filing of the case. Further, he or she must also be the resident of the county for three months before the case is filed. Irrecoverable illness in either of the spouse. State of Indiana does everything for the best nurture of the child. For this, it can grant custody of child to a sole parent or to both of them. Will of the child to live with either of the parents or both. Health, age, and gender of the child. Flexibility in the personality of the child to adapt to the new environment. Affection of the child with other family members in the home. Openness in either of the parents to provide the child with a free atmosphere to meet with the other spouse. Geographic location of the child and his or her safety. Residence of the family mostly goes in favor of the spouse to whom the child custody is given. Economic conditions of the both spouses. Role of both parties in acquisition of marriage property. Property held by the spouses before the marriage. Tax liability on each party after the division of the property. Court has the right to provide the assistance to a deserving spouse paid by the other if property is insufficient for them. Employment chances of the spouse. If the spouse has to forgo the employment for the proper care and nourishment of any child. If the division of the property is not sufficient for one of the spouses. For the education training of the spouse. Income of the both the spouses and their debt obligations. Living standards of the child during the marriage of his or her parents. Needs of the child in terms of his or her physical conditions and education. Need for the medical support for the child. Payment for the child insurance. Upon request of the either of the spouses or on its own, court may order for the mediation for the couple if reconciliation chances are there. There is no need of a lawyer when applying for divorce in the state of Indiana. A divorce case which is filed without any help of an attorney in any of the states is known as Pro Se Divorce. Literally, Pro Se is a Latin phrase and it means "on her or his own". Process of getting the divorce without the help of lawyer may vary from one State to another. These types of divorces are perfectly legal and enforceable in Indiana, and are actually very convenient. Usually, once settlements have been made regarding property distribution and custody matters among the spouses in case of a mutual divorce, Pro Se Divorces are filed.